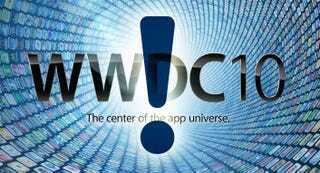 WWDC Prediction Recap: What Was Missing? WWDC 10: Here Comes the New iPhone, But What Else? This may have been the most notable absentee; it was certainly the most disappointing. The pieces were all in place: Apple had purchased music-streaming service Lala in December, then shut it down last week. They'd trademarked iTunes Live. In fact, the only thing missing was a deal with the record labels that would allow your music to go up into the cloud. Looks like those last-minute negotiations didn't quite work out. Don't worry: this will happen at some point. Just not, sadly, today. The leaked vision of the next generation Apple TV was a beautiful thing: iPhone 4 processor and OS, 1080p streaming, 16GB flash storage, $100 retail price. The original rumor—which we should have stuck with—stipulated that it wouldn't be announced at WWDC. But a last-minute mention by Daring Fireball's John Gruber had us thinking it might actually happen. Expect to see it sometime this year, but it's clearly not yet ready for prime time. The Next Apple TV to Be a $100 Screenless iPhone? How long as it been since Mac Pro and MacBook Air were refreshed? Well, since WWDC 2009. And while their refresh lag compared to Apple's other computer lines can easily be explained by hamstrung processor availability—Intel's hexacore Xeon chips and ULV Core CPUs, respectively—it seemed as though those hurdles had been resolved in time for an unveiling today. No dice. And unless we see them in the next few weeks, the competition's going to end up with a decent head start. Honestly, the rumored Mini upgrade—HDMI but no Core processors—wasn't particularly exciting. It could be that Apple's waiting until they can figure out a way to bump up the processors as well as the ports, or just that they didn't want to sully the iPhone 4 excitement with a decidedly less enthralling refresh. What better time than WWDC to introduce a much-needed extensions API for Safari? It's something Apple's home-baked browser definitely needs to keep up with Chrome and Firefox, and another Gruber hint indicated that it may well have been on the way. And if it didn't happen here, it's hard to imagine when it might.Update:While Safari 5 wasn't part of the keynote, Apple announced it later in the afternoon. It'll feature a 30% performance increase over Safari 4 and, yes, an extensions API. Apple's multitouch trackpad desktop peripheral was a late entrant into the rumor sweepstakes, but had one key thing going for it: pictures! So while we now know—or at least firmly believe—that it actually exists, it's not going to be part of Apple's world any time soon. Despite one heckler's opinion, AT&T remains the iPhone's exclusive carrier. That doesn't mean that the WSJ was wrong when they said a Verizon device was coming this fall. It just means that we're going to have to sit tight until we're closer to the rumored release.